What Happened Last Tuesday: Part 2 — Who Did They Vote For? Last week, I shared the news that we at Catalist have developed a new methodology for projecting the true shape of an electorate, almost immediately following Election Day. We followed it up on Friday with estimates of the composition of the electorate, going back to 2006. Today, we’re releasing round 2 of our results: what were the voting preferences of each group? In other words, who did they vote for? Like the last post, we’re going to focus on the national Congressional election, and we will be leveraging a large-scale poll conducted by YouGov, which we combine with our large-scale voter registration database. We’ll also refer back to the changes in turnout/composition described last week, to provide a fuller picture of each of the relevant groups discussed below. As a refresher, or if you’re curious, you can read more about our new methodology in our initial post. In short, we spent the last week combining all of the information available — pre-election projections, early voting, county and congressional district election results, precinct results where we have it available , and polling data — to come up with our estimates. All of this builds on academic work, which we developed in collaboration with Andrew Gelman — the most relevant academic paper is here. A few more methodological notes are at the end of the post, for those who care about the details. For the groups discussed below, we’re showing the share of voters (adding up to 100 percent) and Democratic candidate margins (+10 means the Democrat won by 10 points) for 2014, 2016, and 2018. We also show a few graphs describing how these have shifted over time. There is too much data to show everything at once, so we made a few choices as to what were the most obvious and relevant data points. In the graphs, we show how the share of voters shifted from 2014, the last midterm, because there are long-term structural differences between midterm and presidential turnout. For change in Democratic margin, we instead show a comparison to 2016, which we think is a better baseline for understanding vote margins. Lastly, we use Presidentialmargins in Presidential election years and national Congressional margins in midterm years, because these are often considered the primary national elections for each of those years. If you would like to see data for more comparisons and more groups, the detailed data is here. For all of these, the numbers are rounded, so they may not add up to 100 percent. 1. Young voters surged in both turnout and Democratic support levels. There was an increase in youth turnout (18-29) between 2014 and 2018, from 8 to 9 percent of votes cast. 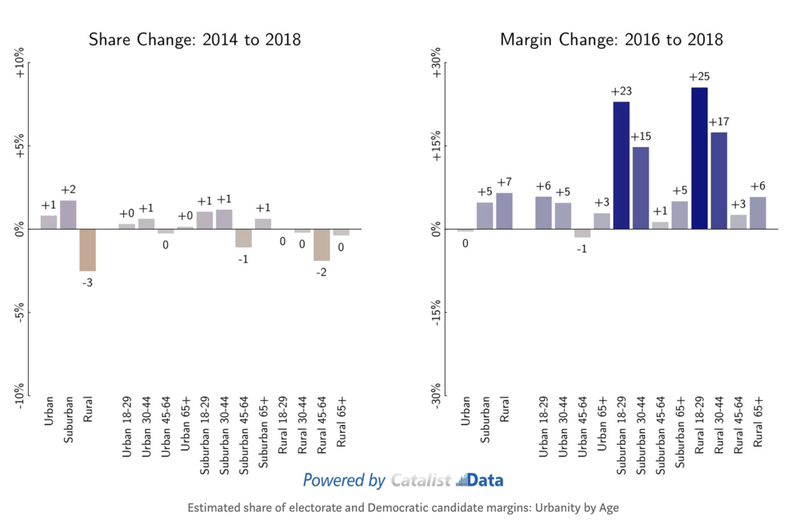 Just as importantly, Democratic vote margins increased substantially since 2016, going from +25 to +44 Democratic. This is especially true among young white voters. In 2016 (and 2014), Democrats and Republicans were essentially tied. In 2018, there was a huge shift and Democrats won them by 26 points. There was also a large shift among 30-44 year olds, who showed a 2-point boost in share, and a 13-point shift in Democratic margin. Again this was bigger among white 30-44 year olds, who voted for Republicans by 21 points in 2014 and 9 points in 2016; they supported Democrats by 9 points this year. 2. 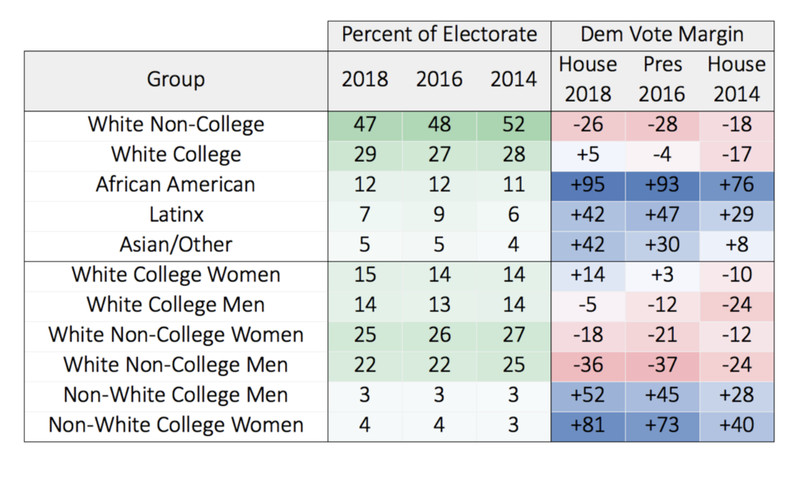 The 2018 electorate was more diverse than 2014. There were big Democratic margin gains among white voters with a college degree, and Asian/Other races. There were turnout gains across the board for Democratic-leaning groups, when breaking things down by race and education. White non-college voters dropped from 52 percent of voters in 2014 to 47 percent this year. They voted for Democrats at roughly similar rates to the 2016 Presidential race, which was more Republican than 2014. The composition was higher, in contrast, among Latinx voters, African Americans, and other communities of color, each of which increased by 1-2 percentage points from 2014. White voters without a college degree also increased by about a point, accompanied by big gains in Democratic margin. We estimate that Hillary Clinton narrowly lost white college voters by about 4 points, but Democrats won them by 5 points this year. Democrats also gained 12 points in margin Asian and other races (grouped together here), going from +30 to +42. Among all of these groups, Democrats had bigger margin gains among women than men. 3. Turnout was down (relatively) in rural areas, and Democratic gains were also the biggest here. Turnout was up across the board compared to 2014, but rural areas didn’t increase by as much. As a result, these areas accounted for 29 percent of voters in 2014, and only 26 percent in 2018. Relatedly, Republican margins were substantially smaller in these areas, going from a 35-point advantage for Republicans in 2016 down to 28 points this year. We haven’t fully analyzed how much of this change is due to composition changes (i.e., different groups of people voting within rural areas) vs. people changing their minds, but both are almost certainly happening to some degree. One important trend here is that young voters in rural (and suburban) areas voted for Democrats by much larger margins in the past. Democrats lost 18-29 year olds in rural areas by 17 points in 2016, and that shifted to +8 this year, a 25-point shift. There were similar increases in suburban areas and among 30-44 year olds. 4. Based on historical models, it seems Republican share was lower than 2014, with the biggest gains in Democratic margin among “middle” groups. Analyzing groups by party identification is difficult for a variety of reasons. We use party registration and a variety of other factors to try to understand historical voting patterns — but this is imperfect, so these results should be considered especially preliminary, and we will explore them further at a later date. That said, this suggests there was a big drop-off in Republican voting between 2014, where they were 40 percent of the electorate, and 2018, where they were down to 35 percent of the electorate. The gain in vote share came from people who are modeled to be in the “middle” — these aren’t necessarily Independents, though there certainly are more Independents in this group than others. But they also include people who we have more difficulty categorizing as either Democrats or Republicans. We also see a big shift in Democratic margin among this group: Clinton lost them by 2 points in 2016, and Democrats won them by 10 points in 2018. In sum, our data suggests that the Democratic win was multifaceted. On one hand, turnout reached record levels, with especially high turnout among young people, communities of color, and people with a college degree. On the other, there were big changes in candidate preferences, almost across the board. The biggest changes came from young voters, college-educated voters and women. It seems that among people who have historically been “in the middle” or harder to predict, they both voted at higher rates and voted more for Democrats. All of these contributed to the Democratic win in the House. For the next phase of this project, we’ll dive deeper into the data. This includes releasing data from select states and congressional districts, as well as highlighting some of the more detailed trends that we find as we analyze the data further. Please check back here for updates! Yair Ghitza (@yghitza) works at Catalist working on statistical research and development. He has worked with Obama for America, Copernicus Analytics, and the MIT Media Lab holds and holds PhD from Columbia. Note: This article was original posted on Medium. We have re-posted with permission from Ghitza. There are two important nuances that we’d like to emphasize here. First: people who view the detailed results might notice that our national margin is currently +6, while various projections have the national topline closer to +7 or even more. Our numbers don’t add up to the House popular vote for two reasons: (1) not all votes have been counted yet, and we will update these numbers when more data comes in. (2) More importantly, we have a slightly different approach than the exit poll and other traditional post-election polls. Namely, we project candidate preferences for voters in uncontested races. Among races with > 95% of precincts reporting through today, there were 22 uncontested elections in the House, and Democrats won those races 20 to 2. This accounts for over 3.5 million votes, with Democrats taking 90% of those votes. These races certainly contributed to Democrats’ popular vote margin, but our view is this does not reflect the “true” voting preferences of these areas. In other words, taking the raw results makes the Democratic victory seem larger than it should be (and goes the other way for Republican victories in 2014 and 2010). This disproportionately impacts voting estimates for some groups more than others, which makes comparisons across years less appropriate. We feel our approach is better for making these comparisons over time. Second: as mentioned earlier, vote totals are still coming in. When they are updated, we will update our models and estimates accordingly. The “final” version of our data will be released after official, individual-level vote history data is collected from the various Secretaries of State. Our original plan was to first release data from a select set of states and Congressional Districts where we were able to collect precinct-level information. It has become clear that people are more widely and immediately interested in the Congressional results, as this reflects the closest thing we have to a description of what happened nationally. This, of course, is the share of the people who voted in this election, not the share of people who could have voted (registered voters) or were eligible to vote. 18-29 year olds were roughly 17% of all registered voters. Details of these challenges are outside the scope of this particular article.